'The work in Taiwan has been like gardening ... from the early work in 2012 laying foundations ... to seeding ... to tending the emerging garden.' 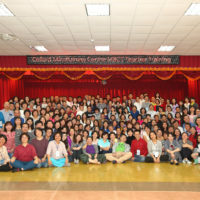 MBCT teacher training in Taiwan by Professors Willem Kuyken and Yen-Hui Lee. How can we best make mindfulness-based cognitive therapy (MBCT) accessible, so its transformative potential is available to those who might benefit? The Oxford Mindfulness Centre is committed to training the next generation of teachers and trainers. We have a 5-10 year aspiration to develop high quality MBCT trainers across the world who can train the next generation of MBCT teachers. Rather than the Oxford Mindfulness Centre offering our Training Pathway internationally, what we’re doing instead is establishing and supporting the development of high quality training centres that, in time, can function independently and offer their own training. The work in Taiwan started with Professor Mark Williams offering a 6-day MBCT seed training in 2012. In the years that followed Dr. Melanie Fennell and Marie Johansson offered further foundational training. Through this process a significant group of MBCT teachers and apprentice trainers have developed. There is now mindfulness teaching in education, physical and mental health care settings, prisons, end of life care, and workplaces across Taiwan. We are pleased to have signed a 4 year partnership agreement with Professor Yen-Hui Lee and the Mindfulness-based Helping Association. After attending the 2018 2nd MBHP International Conference in Taipei, Taiwan, there was a signing ceremony to mark our partnership. Honouring all the MBCT work in Taiwan, OMC Director Professor Willem Kuyken used the metaphor of cultivating a garden. 1. MBCT experiential (module 1). 2. Beginning to teach MBCT (module 2). We had the privilege of seeing approximately 170 people participating in the training. If 150 of these go on to teach MBCT, they will make MBCT and its transformative potential available to hundreds of thousands of people. The training involved many MBCT apprentice trainers at various stages of their journey, but who together are the future of MBCT training in Taiwan. From Oxford to Taiwan, from schools and hospitals to prisons, although we have developed many different type of mindfulness courses, it is the compassion and wisdom in people’s hearts that irrigates this rich and diverse garden. The partnership agreement of Mindfulness-Based Helping Association (MBHA) and Oxford Mindfulness Centre (OMC) is not only established between two institutes, but also between two groups of mindful learners, willing to nourish the global society with love. Together we break the barrier of languages, cultures, races, politics, and social roles and create more MBCT nursery gardens. We look forward to the furthering of the relationship to pave the way for a flourishing of mindfulness practice in Taiwan and Chinese cultural areas.